Welcome to the Best Western Plus Hill Country Suites where customer service is top priority and accommodations are comfortable and affordable. 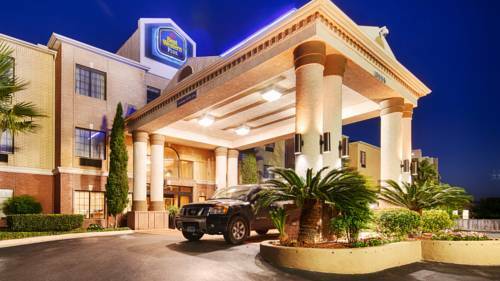 This hotel is nestled in one of San Antonio's best residential and business districts and within walking distance from many local attractions, shopping and dining options. Guests staying at this San Antonio Best Western will enjoy well-appointed guest suites featuring 46" LED TVs with full HD, microwave, refrigerator and free high-speed Internet access. Start the day off right with a complimentary full breakfast, refreshing dip in the outdoor swimming pool and hot tub or with a work out in the fully equipped exercise facility. After a long day, guests are welcome to take advantage of the manager's reception offering beer, wine and hors d'oeuvres Monday thru Thursday evenings. Guests traveling to San Antonio on business will also appreciate the variety of business services available on property including a full business center and meeting space with room accommodating up to 40 people. The Best Western Plus Hill Country Suites is where travelers want to be while visiting San Antonio. Spend a relaxing afternoon exploring all that the nearby Riverwalk has to offer, touring area museums like McNay Art Museum and the Guinness World Record Museum, catching a sporting event at the Blossom Athletic Center or enjoying some family fun at the San Antonio Zoo, Six Flags Fiesta Texas and SeaWorld . And no trip to San Antonio is complete with a visit to the historic Alamo. The Best Western Plus Hill Country Suites is often the lodging choice for guests in town visiting family or friends at nearby Spine Hospital and Stone Oak Methodist Hospital. Traveling to San Antonio on business? Nearby Pearson, Henry B. Gonzalez Convention Center & Valero Corp make conducting business easy and convenient. Make a reservation today and save at the Best Western Plus Hill Country Suites in San Antonio, Texas! From: Interstate 35 South. Take Interstate 10 West. Take Highway 1604 North/East, and take Exit 281 North, stay on the service road and take the Sonterra Exit Ramp (immediate bridge-ramp on the right). Make two right turns at the bridge and the Best Western Plus Hill Country Suites is on the right side. From: Interstate 35 North. Take Interstate 10 East. Take Highway 1604 West, and take Exit 281 North, stay on the service road and take the Sonterra Exit Ramp (immediate bridge-ramp on the right). Make two right turns at the bridge and the Best Western Plus Hill Country Suites is on the right side. From: Downtown. The San Antonio International Airport or North Star Mall at loop 410. Take San Pedro/281 North and exit on Sonterra Exit ramp (immediate bridge-ramp on the right). Make two right turns at the bridge and the Best Western Plus Hill Country Suites is on the right side. Pool - Outdoor pool, 10:00 a.m. to 10:00 p.m. Hot tub - Hot tub, 10:00 a.m. to 10:00 p.m.